MPSC Recruitment 2018 - Apply Online for Maharashtra Civil Engineering Services Main Exam 2018 in Maharashtra. Online Applications are invited by Maharashtra Public Service Commission (MPSC) from 12 Oct 2018 to 26 Oct 2018 11:59 PM for 150 vacancies. 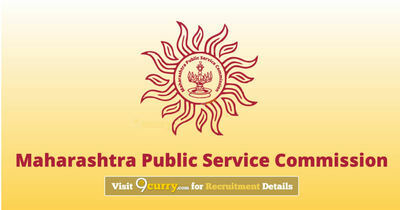 MPSC Maharashtra Engineering Services (Civil) (Main) Exam 2018 Answer Key 2019: Maharashtra Public Service Commission (MPSC) has issued the Answer Key on 28 Feb 2019 for Maharashtra Public Service Commission Maharashtra Engineering Services (Civil) (Main) Exam 2018 . Answer Key can be accessed from the link given below. MPSC Maharashtra Civil Engineering Services Main Exam Answer Key 2018: Maharashtra Public Service Commission (MPSC) has issued the Answer Key on 01 Dec 2018 for MPSC Maharashtra Civil Engineering Services Main Exam 2018 which was conducted on 25 Nov 2018. Answer Key can be accessed from the link given below. MPSC Maharashtra Civil Engineering Services Main Exam 2018 Answer Key: Maharashtra Public Service Commission (MPSC) has issued the Answer Key on 30 Nov 2018 for MPSC Maharashtra Civil Engineering Services Main Exam 2018 . Answer Key can be accessed from the link given below. The selection will be on the basis of Online Examination. Eligible candidates may apply online at MPSC's website (direct link is given below) from 12 Oct 2018 to 26 Oct 2018 11:59 PM. Candidates log on to https://mahampsc.mahaonline.gov.in/. Click on “New User Registration”, if you are a new user.